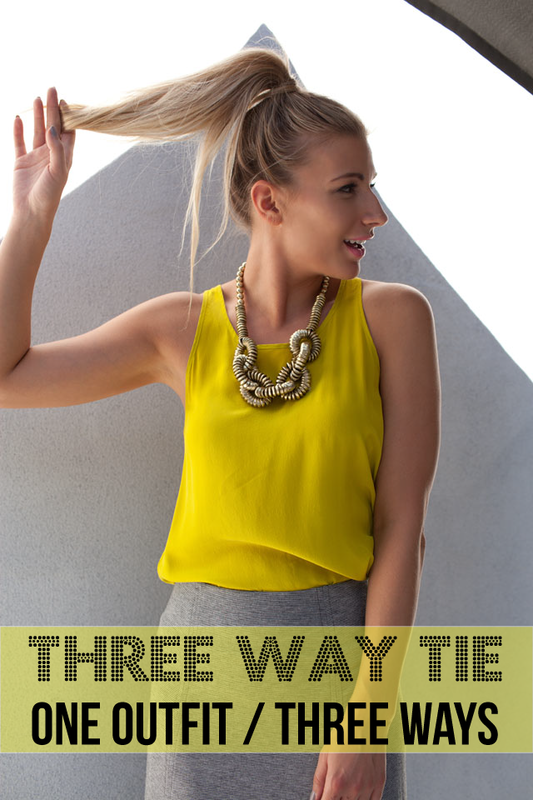 Three way tie isn't new here at Trend Struck but demonstrating how you can wear one look from head to toe three different ways is. Don't get bored with what's in your closet instead get inspired on how you can wear the same things you've been wearing just differently. This could easily be done by accessorizing your look, belting it, adding layers to it or something even more simple such as how you are actually wearing your clothes. Confused by that? Well here my look combines a simple silk tank, in chartreuse (my favourite), with a grey maxi skirt. Chances are you would choose to either tuck in your blouse or let it hang out. Both are great but I would like to push you into trying something else. Why not knot your blouse either in the centre or off to the side to expose just a little bit of skin for summer? Not into skin baring? Then go south and knot your maxi off to the side which will create some nice draping of the skirt and will allow those fabulous shoes underneath to make an appearance! Scroll on to see how I've achieved these three styling techniques and try it for yourself!! Beautiful job! I just love this skirt and you styled it perfectly with your bright top. Such a flattering look on you!